It’s been much too long since I last spent a decent chunk of time on classics like Out Run, Lotus Esprit Turbo Challenge and similar 16-bit arcade racers. Much too long indeed. Something tells me Horizon Chase Turbo is going to fill that gap quite nicely come launch however, what with its nostalgic blend of old-school gameplay and modern-ish visuals. That’s all you’ll get from the above screenshot, at least. But digging a little deeper reveals that, when you’re not trying to keep up with the twists and turns of the road… there’s tuning and tweakin to do at the garage! 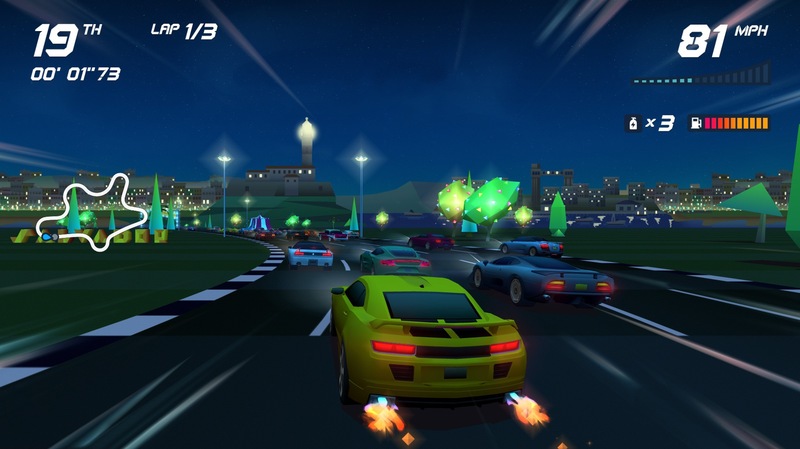 Much like in Horizon Chase – World Tour, the mobile game that Horizon Chase Turbo originated from. On a related note, this upcoming version is not a mere port, as the developer has “redesigned the game from the ground-up”. That and unlockable cars, because racing game. Oh, and like most genre entries from days long gone, Horizon Chase Turbo will enable friends and enemies alike to get competitive with split-screen multiplayer for up to four people. Unfortunately that’s also the only way to play with other people – directly, at least: Online Competitive Ghost Mode is totally a thing, even if it is… well, ghost racing. Still better than nothing, though. So to summarize: Tournament, Endurance and Online Competitive Ghost Mode with lots of car s to unlock and upgrade. Ah, and then there’s the ‘levels’: 12 cups on 109 tracks spread across 48 cities. An impressive amount of content for sure, increasing to the already lovely replay value, Horizon Chase Turbo being an arcade racer and all. Horizon Chase Turbo will be available on Steam and PlayStation 4, come May 15. XBOX One and Switch? “Later this year”.